It was a terrific day to be fishing on Lake Whitney today… cloudy, cool and not much wind. The McCown and Cedron Creek ramps remain in good shape…. We were the first on the McCown Valley ramp this morning, dropping the boat in the water about 6:15. But we were not the first on the lake. There were folks who launched just before us from the Cedron Park ramp. They fished the same areas we did…. hope their luck was a bit better. Actually, if the fish had had some size to them, we would have classified it as a great day. The Boss put three in the boat and I had one. But, they were all small fish. She caught all of her fish on a Texas rig. I wore out a Spook and a Pop-R, but boated only one small fish that I pitched back before she could get the camera out. I missed two or three other small fish. Actually if was very nice out… the little bit of wind kept us cool and it was easy to maneuver the boat… not work which was good for me. We did (or I should say The Boss did) take a few pictures. 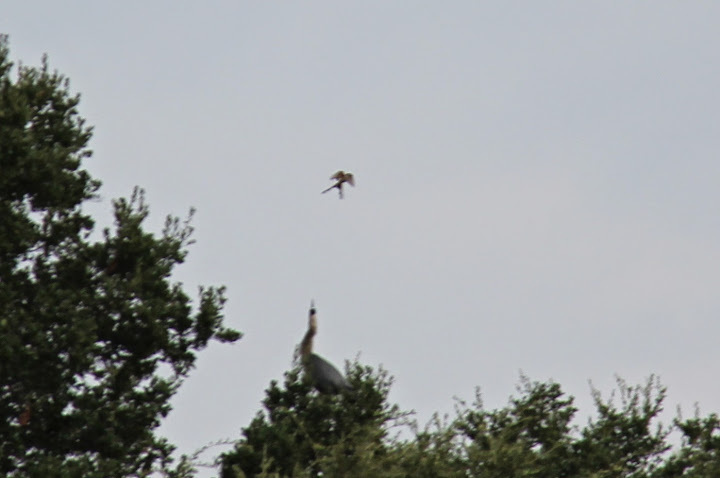 This last one was a bird fight we got to enjoy for 5 or 10 minutes… one of the blue herons being harassed by a scissor tail fly catcher. It started out down near the water then escalated to a tree top… that fly catcher was really angry and letting that blue heron know it. While we didn’t catch any fish of any size and The Boss caught all of hers between 6:15 and 7, it was still a good day. I enjoy watching fish blow up on the top water lures even when they miss them. It seemed as though they were just slapping them out of the way today… certainly were not gobbling them down…. We had fun. There were just a few folks on the lake. Two more rigs were on the ramp when we got back, but I think they fished some place besides Cedron Creek.